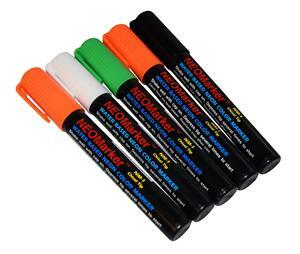 These Neon Waterproof Window Pens are great as a sign marker pen. Writes on nearly anything...GLASS, PLASTIC, METAL, STONE, ACRYLIC, CERAMIC! Stays on in the rain, but easily removes with most window cleaners! A neon marker with a chisel tip for fine to medium writing width gives you lots of control. Colors Include: 2 Orange, Green, Black & White. Buy a Full 5 piece set and save money!